Just a few days ago Verizon Wireless announced that it is offering the Android 2.3 Gingerbread update to the Motorola Droid Pro and the Motorola Droid 2 Global. Both phones will receive the new Gingerbread operating system from Google, which includes a number of new features as well as bug fixes and tweaks. The update is available for download over the air, and can be initiated via the device systems tools. There is no official word till now about the Android 4.0 Ice Cream Sandwich update for Motorola Droid Pro or Droid 2 Global. 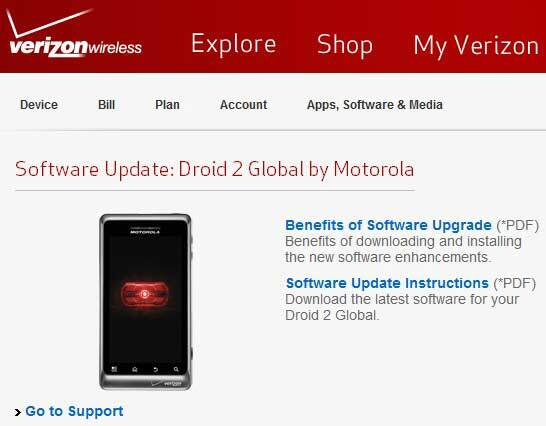 Check Verizon Wireless support site to see the benefits of Android Gingerbread upgrade for Droid 2 Global. Software update instructions can be found there too. Link for the Motorola Droid Pro users is in here.